How many Canadians wear seatbelts? What is the prevalence of belt use among crash victims? 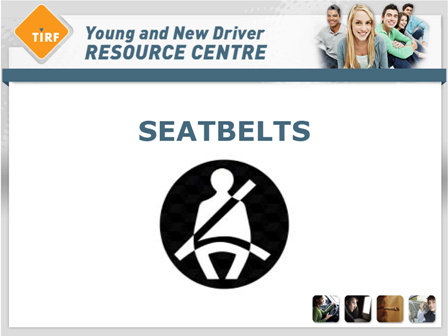 What is the prevalence of belt use among teen crash victims? When are young drivers less likely to buckle up? How often do young passengers wear seatbelts? Are Canadians concerned about seatbelts? What do young drivers think about seatbelts? What are the myths about seatbelts? Are there provincial laws about seatbelts? What can parents do to encourage seatbelt use from a young age? What is the proper way to wear a seatbelt? What programs and initiatives exist to encourage seatbelt use? Drivers who are already considered ‘risky’, such as drivers who follow too close to other vehicles, run red lights or speed, are less likely to buckle up, and even more likely to be involved in crashes. These drivers are also more likely to have previous traffic violations. Drivers who have consumed alcohol are more likely to drive without buckling up.11 This is important because many fatal crashes involve alcohol (more than 30%), and by driving without a seatbelt, drunk drivers are putting themselves in even more danger behind the wheel. Although a majority of Canadians wear their seatbelt, a large proportion of those involved in crashes were not wearing seatbelts at the time of the crash. According to Transport Canada, between 2006 and 2010, the percentage of drivers who were fatally injured in a crash and were not wearing seatbelts ranged from 33.6%-36.9%. Studies show that when young drivers are driving late at night, with passengers that have high blood alcohol content and with passengers under the age of 29, seatbelt use is much lower than when young drivers are driving alone.15 Thus, a decline in seatbelt use occurs in some situations involving young drivers who have the highest risk of crashing. It is already known that young drivers increase their risk of crashing when driving at night and/or with young passengers. Failing to wear a seatbelt in these situations make young drivers even more vulnerable to death or injury in a crash. When respondents of the 2008 Road Safety Monitor (RSM) released by the Traffic Injury Research Foundation (TIRF) were asked what driving behaviours most concerned them, not using a seatbelt ranked third last on the list. Only 66.1% of respondents considered this driving behaviour to be very or extremely risky. Drunk driving ranked first with 95% of respondents considering this an extremely risky driving behaviour.19 This means that Canadians are only moderately concerned with seatbelt use and do not consider it as dangerous as drunk driving, although lack of seatbelt use plays an important role in many deaths caused by speeding, drunk driving, and other dangerous road behaviours. When there are airbags, you don’t need to wear a seatbelt. It is unsafe to rely on other vehicle safety features instead of seatbelts; airbags deploy at high rates of speed. Seatbelts prevent passengers from escaping from a burning vehicle or a vehicle submerged in water. Seatbelts are unnecessary for short trips at low speeds. Seatbelts actually reduce the severity of injury in a crash. It is safer to be thrown out of/away from a vehicle in a crash. Yes. All provincial Highway Traffic Acts have laws regarding the proper use of seatbelts in vehicles. For example, all seatbelts in the vehicle must be working and worn by all passengers present. If passengers are under age 16 it is the responsibility of the driver to ensure they have a functioning seatbelt and are wearing it properly. There have been several efforts by the government, non-profit organizations and police forces to encourage drivers to buckle up. Fortunately, these initiatives have strongly encouraged usage, but young drivers are still the least likely age group to wear their seatbelts, and this needs to change. Devices such as the ‘rollover simulator’ have been developed to show young drivers the significant difference between a crash while wearing a seatbelt and a crash without wearing a seatbelt. The rollover simulator is a cab of a vehicle with a motor mounted on its top. The motor rolls the cab, simulating a rollover incident, and straw-filled dummies are used to show the effectiveness of seatbelts with them being belted and later unbelted. The goal of the rollover simulator is to help save lives by showing people that seatbelts are the best protection in most types of single vehicle crashes. Saskatchewan Government Insurance has partnered with the RCMP to take this simulator on the road to rural high schools, First Nations communities, trade fairs, malls, and other community events as part of its traffic safety education program. The most successful seatbelt enforcement campaign ever in the United States was the “Click it or Ticket” program developed by the NHTSA. This program was aimed at young drivers, especially males, and encouraged seatbelt use by raising awareness about the fines for the infraction. Television commercials, posters, and other public advertisements made the program a success and seatbelt use by 16-24 year olds increased from 61% in 1996 to 82% by 2003. Jurisdictions that adopt this comprehensive approach can achieve usage rates of 95%. This program illustrates the importance of the role that law enforcement and fines play in influencing the behaviours of the young driving population. The Children’s Hospital of Philadelphia. (2013). Miles to go: Focusing on risks for teen drivers. National Teen Driver Safety Report. Transport Canada. (2010). Canadian Motor Vehicle Traffic Collision Statistics: 2010. Retrieved from: http://www.tc.gc.ca/eng/roadsafety/tp-1317.htm#11.